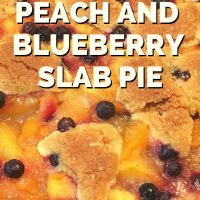 I may be a little late to the party where “Slab Pie” is concerned, but once I got here I can’t stop making this incredibly easy wonderfully delicious pie! My sous-chef dish-washing mother loves pie. She taught me to make pie when I was a girl and we have both been making pie ever since. But let’s be honest, we don’t always have the time (or energy) to make the crust, put together the filling, roll it, bake it, and end up with a serving for 6! 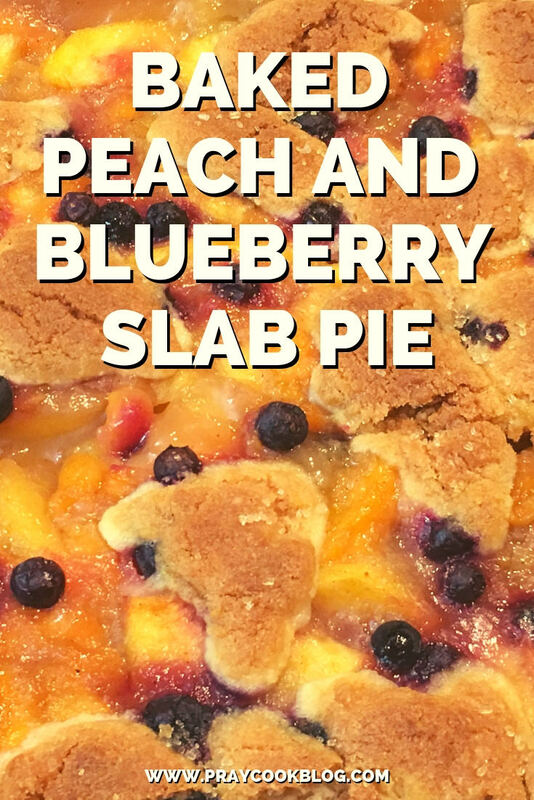 Enter the slab pie. 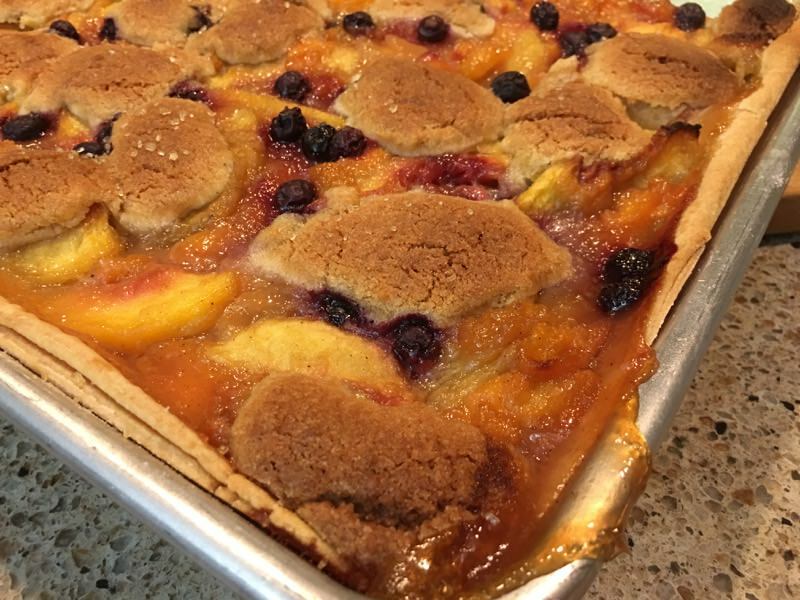 This is your favorite pie filling baked in a 15” x 10” x 1” jelly roll pan, sheet pan, baking sheet – whatever you call it! At our house, we call it a cookie sheet! Using two Pillsbury* refrigerated pie crusts, this recipe will give you 16 to 20 servings with about 20 minutes preparation time and 55 minutes baking time! The original recipe I used came from Pillsbury’s website. I have tweaked it just enough to fit my taste and style! The best thing about this recipe is that you can make it your own by swapping out the peaches for your favorite or adding cinnamon or even apple pie spice! I used a combination of fresh and frozen peaches and 2 cups of frozen blueberries from last year’s garden. 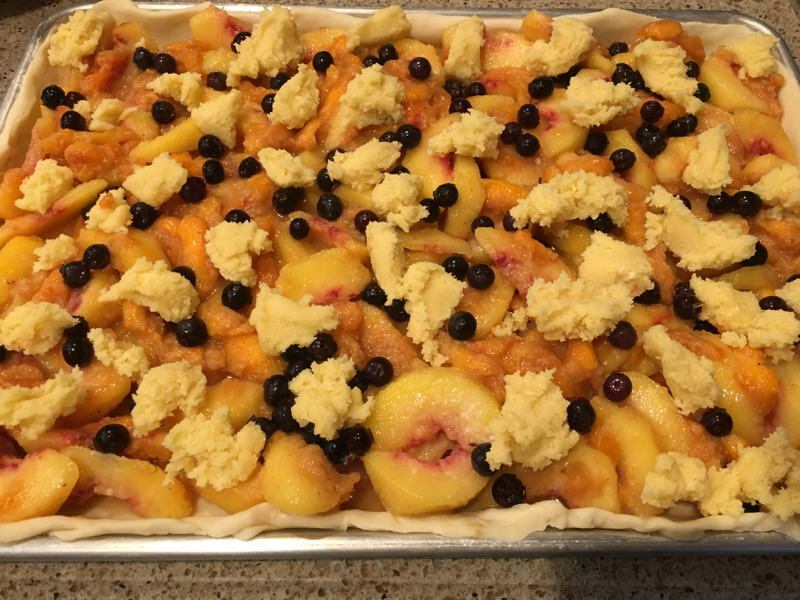 The pie can easily be made without the blueberries but they go very well with peaches. The surprise topping is the crowning touch! Sugar cookie dough is crumbled across the top of the filling and when it bakes up the filling raises around the cookie dough creating a slightly crunchy, slightly soft, sweet, perfectly tasty pie. I tried this with homemade sugar cookie dough and I found the Pillsbury to work better. I think my dough was too soft to begin with and the refrigerated sugar cookie dough is just the right consistency for the topping. Recently I made this pie again using a combination of blueberries, blackberries, strawberries, and raspberries from the frozen section of the grocery store. It could not have been easier and my family really went nuts over it! Since I bake for compliments it all worked out well. We would love to know if you try this with your favorite pie filling and how you like it! *You don’t have to use Pillsbury pie crusts. You can make your own or use the no-name store brand. I have tried other pre-made crusts and Pillsbury just happens to be the only one I think is close to homemade. Enjoy with whipped cream or ice cream. 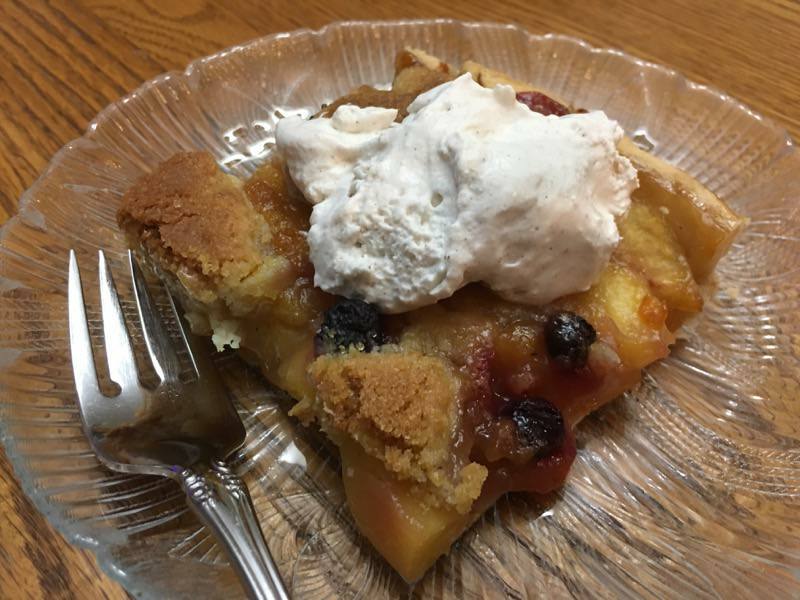 Remove the pie crusts from the box and bring to room temperature for about 20 to 30 minutes. On a lightly floured surface, unroll and stack the crusts one on top of the other. Using a rolling pin shape dough to a 17” x 12” rectangle. Gently move the crust into your ungreased 15” x 10” x 1” baking sheet. Press lightly into the corners and up the sides of the pan. Fold any extra crust even with the edges of the top of the pan. It is important not to have any tears in the crust. In a large bowl, mix the brown sugar, corn starch and lemon juice. Stir in thawed fruit or fresh fruit. Coat the fruit well with the mixture. (It is the cornstarch that will thicken this mixture as it bakes). If your fruit is particularly juicy you may want to add a little more cornstarch. 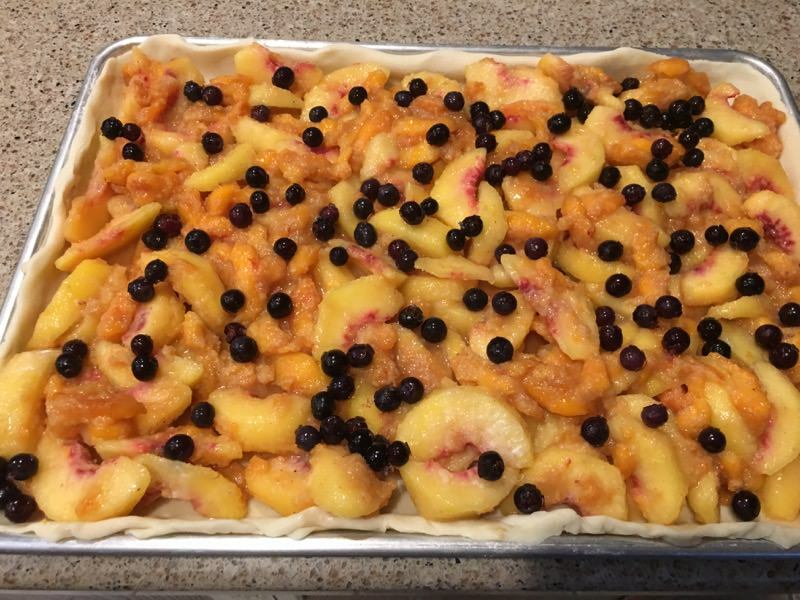 Spoon the fruit mixture into the crust-lined pan. Break cookie dough into coarse chunks and sprinkle evenly over the filling. Bake 55 to 60 minutes or until the crust is golden brown and the filling is bubbling. Cool for 45 minutes. Cut and serve.